With election season upon us, let’s take a look at how social media is being used and leveraged in the presidential race. Let’s be clear from the outset, this is not a post about politics. I am not here to endorse or comment on either side other than its use of digital tools. Any purely political comments will not be allowed through our moderation queue. This is especially important after the last presidential race, when Mr. Obama’s social strategy became a key factor in his winning of the Oval Office. Four years ago, the tools were far less evolved. Facebook was a small presence in 2008, for instance, whereas now it’s the 800-pound gorilla in the room. Pinterest did not exist yet, and the explosion of geolocation apps like Foursquare was still in the future. Combine the advances we have made over the past four years with high degree of political polarization, and you can be sure the next few months are going to be interesting. In the past two years, social media flexed its “real-world” muscles. From the Arab Spring to “the 99%” and beyond, we have seen the digital realm directly influence our world. Just ask Netflix, which got roasted over the coals for hiking its prices and watched its stock plunge in the process. It is hardly surprising that as November looms, we will be seeing a heavy focus from both sides of the aisle on Twitter, Facebook, and other social platforms. With both of the national conventions having recently finished, we can estimate some of the reach each candidate is getting out of his team’s digital efforts. Since Twitter has proven itself to be at the forefront of “real-time” data communication, let’s start there. Michelle Obama’s speech last Tuesday generated 28,000 tweets per minute, doubling the figures attained by Mitt Romney’s from the prior week’s RNC. Mrs. Obama herself adds roughly 1.5 million Twitter followers to the equation for the incumbent. Meanwhile, the President himself has been doing a good job of nurturing the followers he has built up over the prior election, and currently has almost 20 million followers on Twitter. Any campaign in social media is a long slog. It requires a lot of discipline as you try to generate content constantly. In this respect, the Democrats seem to be steps ahead of their competition. A recent Pew Research study analyzed and compared the social media activity of the two campaigns between June 4 and June 17, 2012. The numbers show a vast gulf between the two sides. For one thing, the Romney campaign tweets on average once a day compared to an average of 29 times a day by the Obama camp. Obviously, the incumbent is going to reach many people in many more time zones that way. According to the study, Obama also produced twice as many blog posts and YouTube videos as Romney. As with all situations of this type, the quality of the content means a lot, but Obama has a long history of well-crafted messaging to his credit, so I doubt that’s a worry for him. Recently released data from Eventbrite seems to confirm that the partnership has paid off: Republicans hold 42% more events than Democrats through Eventbrite (71% vs. 29%), Republican gatherings have an average of 14 more people (68 vs. 42) and 14% more events have been community-driven and free in battleground states, such as Colorado and Florida (77% vs. 63%). This last metric is far more important than many would think. Using social media to drive face-to-face interaction is one of the best ways to see a return on your efforts. I often talk to my clients about “closing the gap” by meeting people from their circles in person. It solidifies the relationship in a way no digital interaction can. As you grow your online community, there is no way to escape criticism in the very public spotlight of the Internet. How you deal with that criticism will eventually define your continued success in the social media space. Soon after actor Clint Eastwood wrapped up his ‘Invisible Obama’ speech at the 2012 Republican National Convention, where he criticized the President about broken promises, a memorable photo graced the top of Obama’s Twitter news feed. 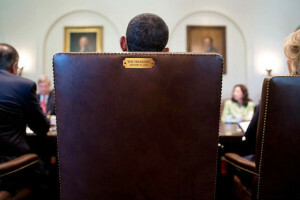 With three simple words, ‘This seat’s taken,’ the president’s team posted a photo taken from the back of his chair, sharing a very clear message about who is in charge. In 2012, visual social media is on the rise. According to an ROI Research study, ‘forty-four percent of respondents are more likely to engage with brands if they post pictures than any other media.’ So, if the community gets tough, it could be time for you to get snapping. All in all, I’m sure we are up for the usual roller coaster ride over the next few months. One good thing about this season is that when it’s over, I’m sure we will have a wide array of new examples — both of vibrant successes and dismal failures. From a social media standpoint, it’s truly fascinating. Image by Barack Obama, as tweeted.